Brian Reed Abell, 60, passed away surrounded by his family on January 14, 2019 at Kadlec Regional Medical Center in Richland, WA. Viewing will be January 24th and 25th during normal business hours at Mountain View-Colonial DeWitt, 1551 The Dalles Military Road, Walla Walla, WA. A Funeral Service will be Saturday, January 26, 2019 at 10:00am also at the funeral home with Gordon Reoch officiating; there will be a reception to follow. A concluding Graveside Service will be at the Summerville Cemetery in Summerville, OR later that same day. Brian was born and raised in La Grande, Oregon to Bernard M. Abell and Phillis R. Gerdes. He became interested in funeral services while still in high school. After graduating, he served his funeral director apprenticeship in The Dalles, Oregon. He later graduated from San Francisco College of Mortuary Science; and he became an Oregon licensed Funeral Director and Embalmer in 1981. 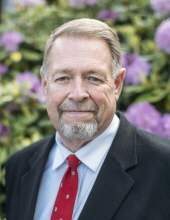 Brian was a Funeral Director and Embalmer for 38 years and he served many families in several communities, including Portland, Prineville, Ontario, Pendleton, La Grande, and Walla Walla. He had been active in community service where he had served as a past board member of Hospice as well as a past president for groups including Chamber of Commerce and the Rotary Club in various communities. He loved his family first and foremost and loved spending days with his dad, boys and his grandchildren. In Brian’s spare time he enjoyed the outdoors where you could find him either hunting, fishing, rafting, or cruising around on his Honda 90s; all as long as his four-legged best friend Deke was by his side. He grew up being a brave and adventurous soul with many stories to tell. He will be greatly missed by all who knew him. Brian is survived by his three sons; Jared Abell, Trevor Abell, Court Abell, a sister, Marvel Abell-Dement, 11 grandchildren, stepmother, Shelley Abell, and two stepbrothers, John and Jerry Mclean. He was preceded in death by his parents. To plant a tree in memory of Brian R. Abell, please visit our Tribute Store. "Email Address" would like to share the life celebration of Brian R. Abell. Click on the "link" to go to share a favorite memory or leave a condolence message for the family.